Pancakes are a thing of beauty. They are a regular fixture on the menu in our house and despite being atheists we will happily celebrate pancake day with double helpings of pancakes. I’ve grown up on lemon and sugar pancakes – you can find my recipe here – but for the last ten years I’ve been dabbling with American fluffy pancakes. I first cooked blueberry pancakes on my hen weekend and I was hooked. Over the last decade I have tried, tested and refined until I think I have the perfect blueberry pancake recipe. 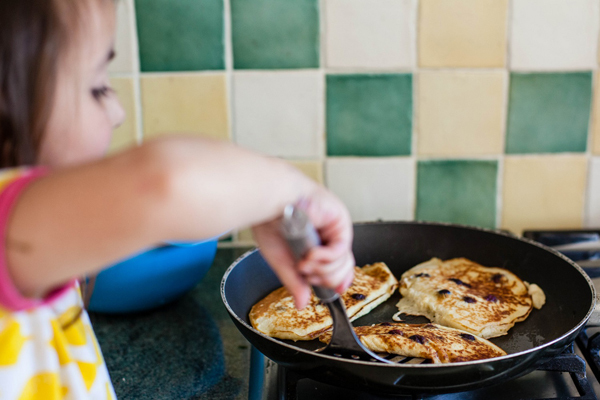 I shared it in a Father’s Day story I wrote for The Simple Things Magazine blog and in honour of Shrove Tuesday I’m sharing it here. The sweet and fluffy american pancake is the perfect foil for the jammy and slightly sour blueberry. These sweet little clouds are great in the morning or as an afternoon snack. 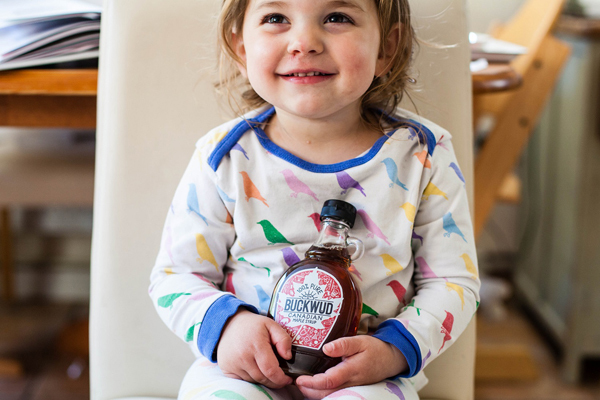 Of course it is practically illegal to eat them without maple syrup – make sure you stock up! Melt the butter in a pan on a low heat and set aside to cool. Sieve the dry ingredients into a bowl and stir to combine. Lightly whisk the milk and egg together then pour the melted butter in and whisk again. 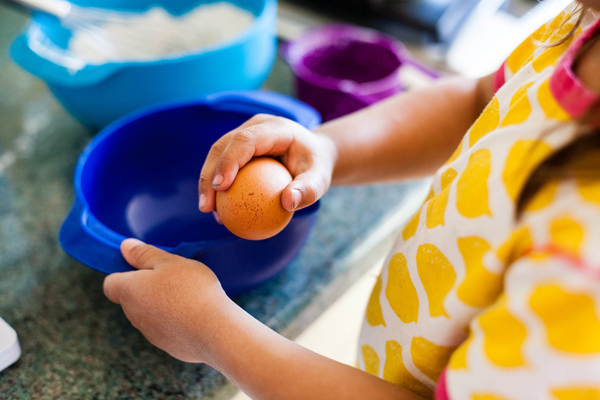 Add the dry ingredients to the wet ingredients and whisk to combine only. You will have a lumpy batter, over whisking will activate the gluten and make your pancakes tough. Rub a large frying pan with butter or oil and use a small ladle to drop the batter onto the pan over a medium heat. You should be able to fit several in at a time depending on the size of your pan. As they begin to cook drop blueberries into the surface of each pancake. Cook for 1 – 2 minutes on each side until they are just done – you should see little holes form on the surface and they should be lightly browned. 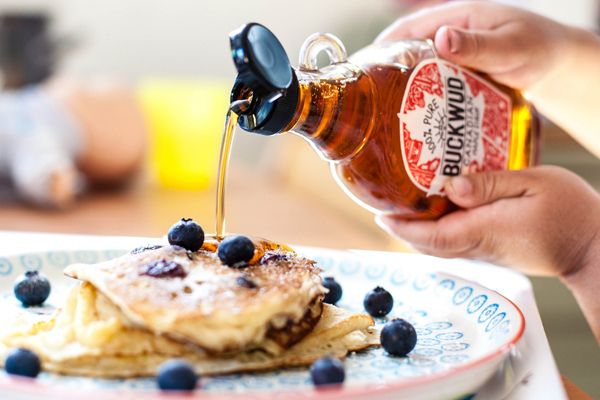 Serve hot with a generous glug of maple syrup! 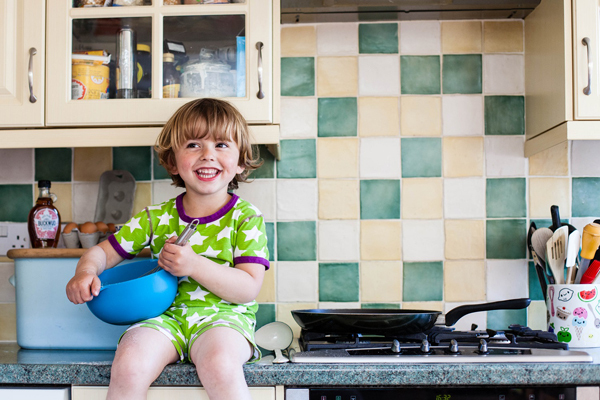 I know this post is about pancakes, but I couldn’t focus on anything other than your adorable little sous chefs! They look so happy and bright, and their clothes are just darling! Hope you had an amazing pancake day, your blueberry beauties sound like they would be lovely with some lime and sugar.